Since I intend to finish up the Turn A route after this update, I will show of it's intermission first. The Gundam X one will be shown off afterwords. : I'm just glad to know you're all okay. : Yeah, along with Kamille, Quatre, and others. Along the way, we came into contact with this land warship called the Freeden. : Yeah. 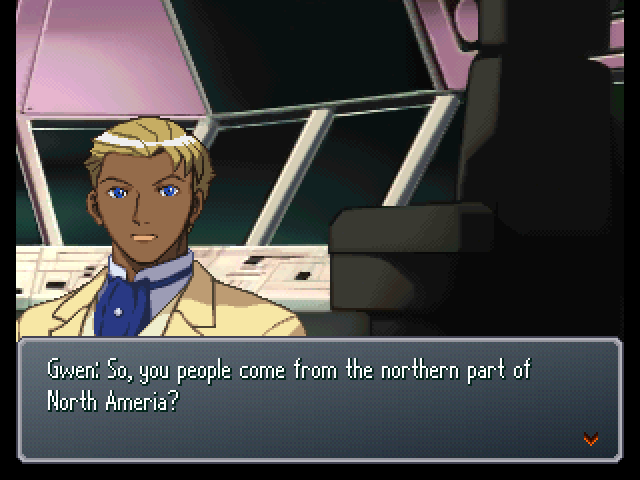 You guys were in the northern part of North Ameria, right? : So we've got info on three highly different areas between us. : Thinking it over, this world feels somehow... intentionally designed this way. : By the way... Was that GX Gundam also dug out of the ground? : Yeah, right after we made contact with the Freeden. : Of course not, it's a Gundam. : That's not what we mean. : High output... Enough to sink a battleship in one shot? He isn't joking. 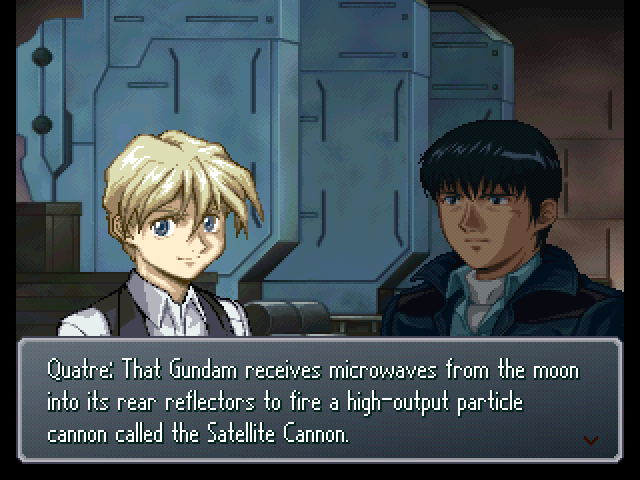 At this point, The Satellite Cannon is second only to God Voice in terms of power. : So Project Aegis succeeded even without us there...? : The Earth's changed completely, but mankind is still alive. : But... I think there's no doubt some huge disaster occurred in the past. : That's probably just a cheek guard. : Hmm... Okay, what kind of Gundam is it? 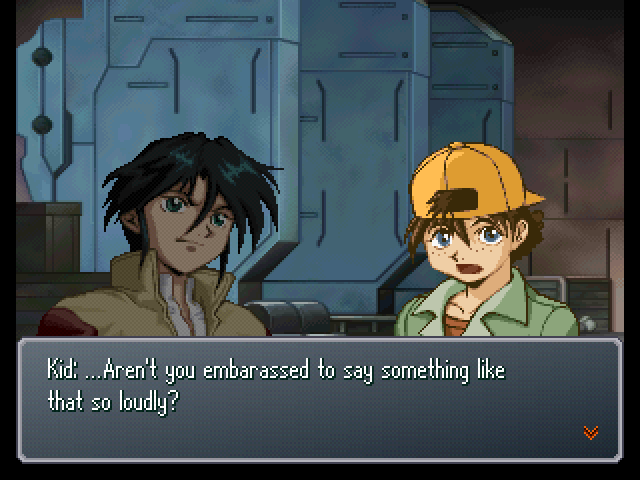 : Beats me... Haro, do you know? : TYPE NOT RECORDED IN DATABASE. : Like the GX, huh? 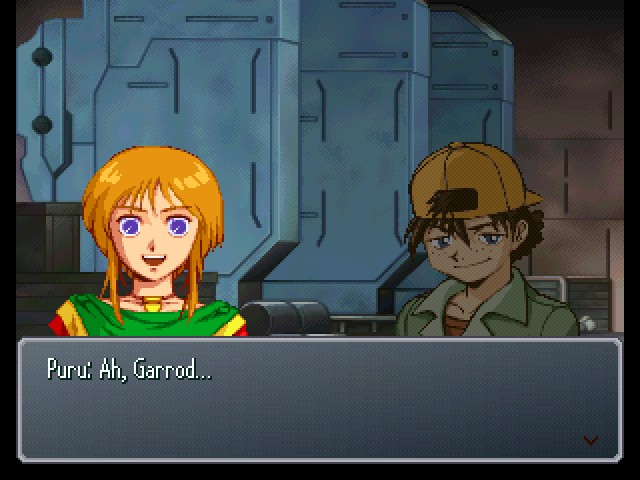 Garrod, do you know anything? : Nope, got me, but... In the last battle, this upside-down A appeared on the GX's monitor. : Hey, that's what was in the electric book Loran was carrying, too. : Electric book? Ohh... You mean a computer manual, right? : An upside-down A... Would you call that a Headstand A? 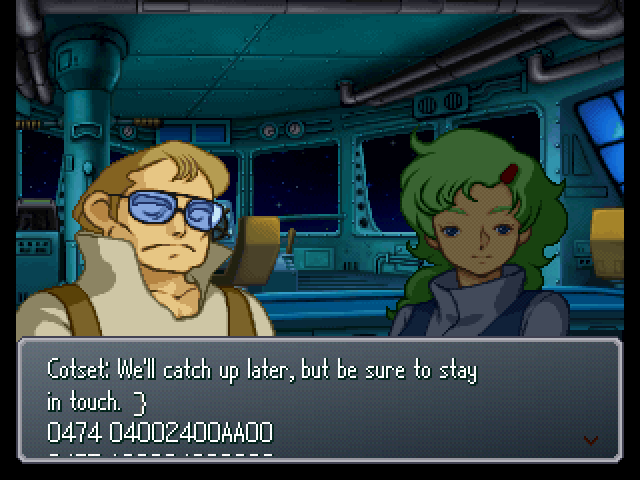 : Tex, you know about that mobile suit? : What were those butterfly wings Tifa was talking about? : ...Sorry, but I'm not too sure on the details myself. : Wh-what are you doing here, of all places...? : It's not Diana. It's my sister, Kihel Heim. : Yeah. She gets that a lot, since they look so much alike. Right, Sis? : What's wrong? You're all pale, Doc. Is this one of those cases of a doctor neglecting his own health? : Yeah. After talking it over, we've decided to split into two groups and look for our friends. : There might be friends of ours in Fort Severn. : I see. So, who's going with whom? 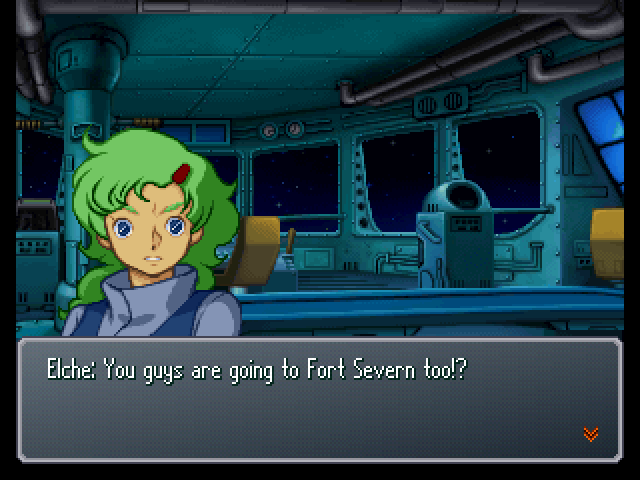 : The ones heading for Fort Severn with the Freeden are... Kamille, Four, Roux, Judau, Puru, Usso, Marbet... Me, Mari, the Combattler Team... And Garrod's group, which was with them to start with. : So the ones staying on the Iron Gear are my group, Tetsuya, Jun, Boss... 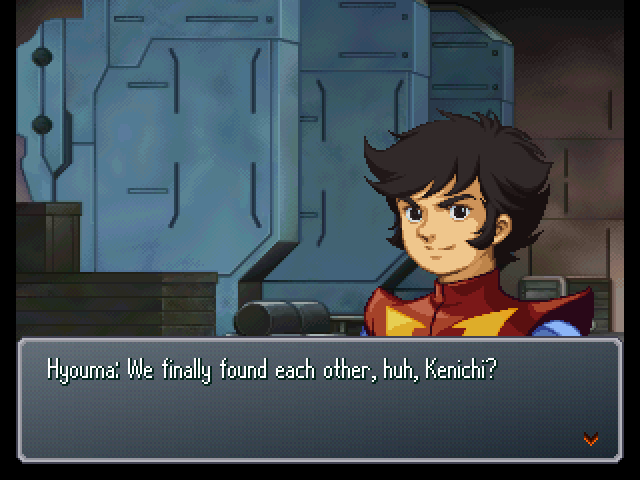 The Voltes Team, Kou, Lieutenant Monsha, and Loran's group, right? : Eh? Who all was going to Fort Severn again? : It's your fault for not listening, Cotset. I've already decided to finish up the Turn A plot first, so I will be staying in Vicinity. : That'll depend on the Innocent themselves, won't it? Are you feeling alright Cotset? that last part sounded like gibberish. : Right, I know. Cotset, you guys be careful, too. Now let's see the Gundam X side of things. : Could I trouble you to share what brought you here to Vicinity? : Is that the name of a new model of walker machine? : Laura, do you know what that is? : Sir Jamil, if you would be so kind as to explain? 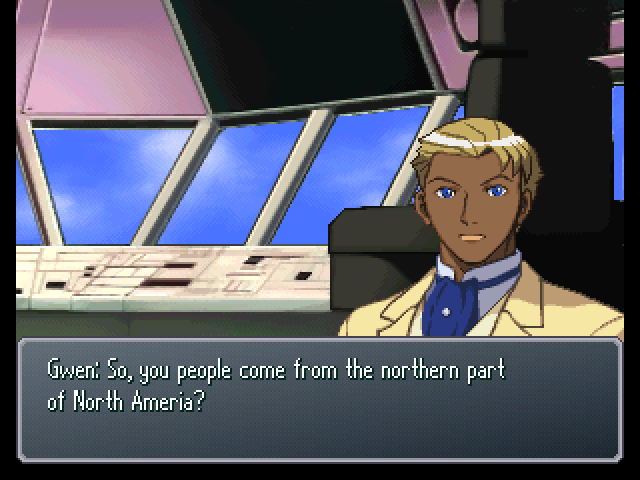 : ...Newtypes are people with special abilities... They played a major role in past wars between the moon and the Earth. 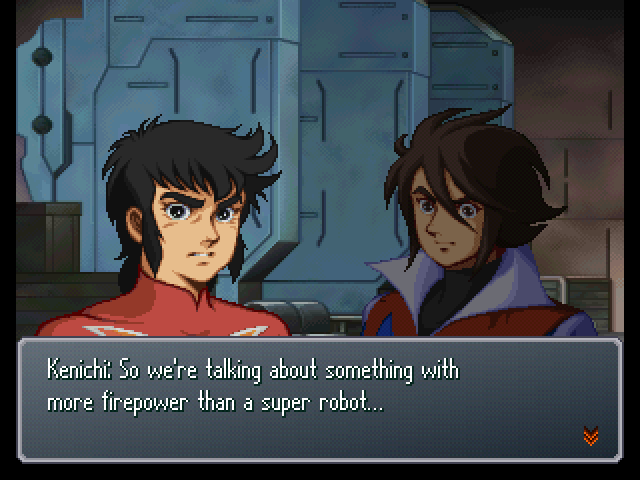 : Yes, they have a power needed to control the Satellite Cannon and Bit mobile suits... They're people who were used as tools of warfare, and died... And the Innocent are trying to gather their descendants for the upcoming fight. : So they're trying to round up these Newtype people to fight, like they did with us? : (.........) Then, whatever your reasons... Are you also unwilling to accept a Moon Race invasion? 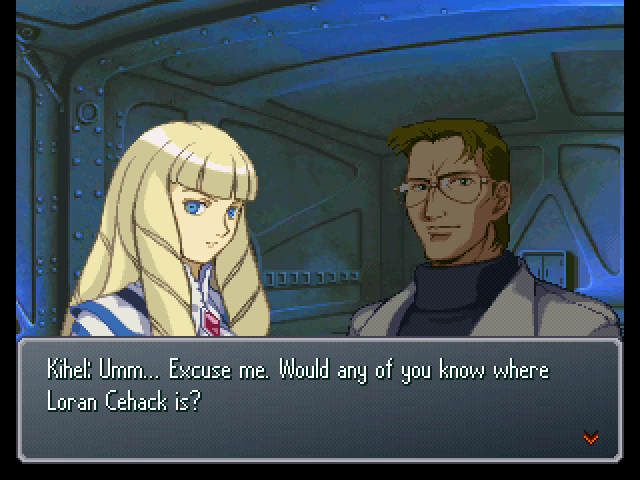 : How about it, Miss Elche, Sir Jamil... Would you be willing to join hands with me? : With this much firepower concentrated together, we can face the Diana Counter as equals. That would allow us to negotiate with them on equal footing. : Fort Severn? Why, that's where we're headed! : Yes. The Innocent are massing forces there to fight the Diana Counter... And Tifa senses a Newtype there. So that's where we're going. : ...I see. And you, Miss Elche? : (...If the Freeden goes to Fort Severn... 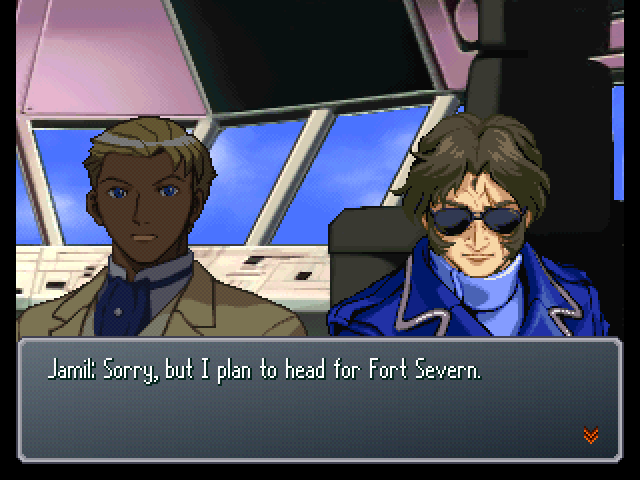 They might wind up fighting with the Innocent...) I think I'll hold off on going to Fort Severn. : We won't survive if we cause any disputes with the Innocent... To say nothing of how different the continent is! : What, you haven't heard of the Innocent either? : (.........) ...In folklore passed down through noble families like House Rhineford or House Borjarnon... It is said that long ago, we were once called Innocent. : Then, Sir Jamil... Even if you are taking separate actions... I would like to ensure some means of communication. We would also like to learn more information about Fort Severn. : Hey. 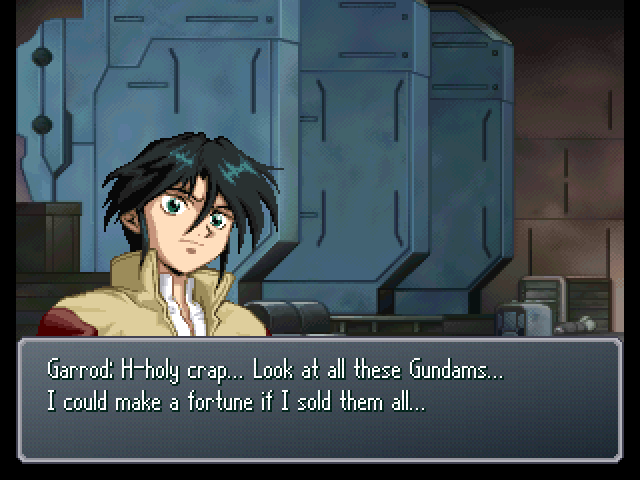 Gundam boy... Are you still talkin' about that kinda thing? : I don't recall giving some brat permission to call me boy! : Tryin' to sell the GX for profit, that's something a brat would do. : Can it! That Gundam's mine! I've decided to protect Tifa with it! : What, you got a problem with that? : Eh, whatever. You seem to be able to bring out the GX's abilities well enough... This way, I can get some nice data. : Tch... You really are an annoying brat. : Whoa, I don't need to be wasting my time with Gundam boy. I'd better go check out the mustached mobile suit. : So the person you were all worked up over was on the Freeden after all? : Eh, maybe... Well, you took a load off my chest. Thanks for that. : It's no big deal! 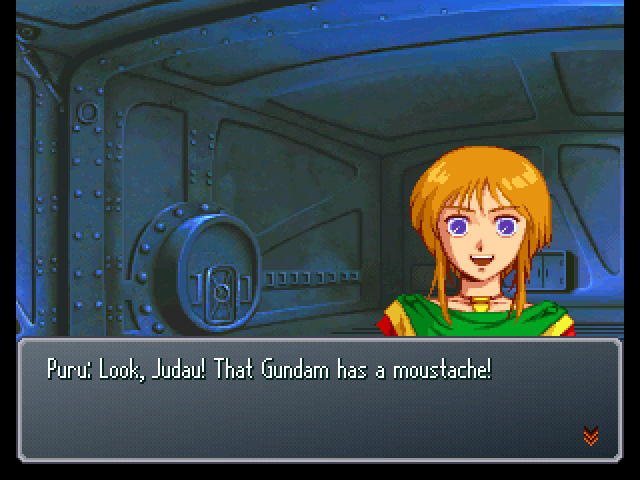 : By the way, that moustached mobile suit... Is that another Gundam? : That weirdo guy earlier was screaming out that it's a Gundam. : Oh, is it called Gundam? We just call it the White Doll. 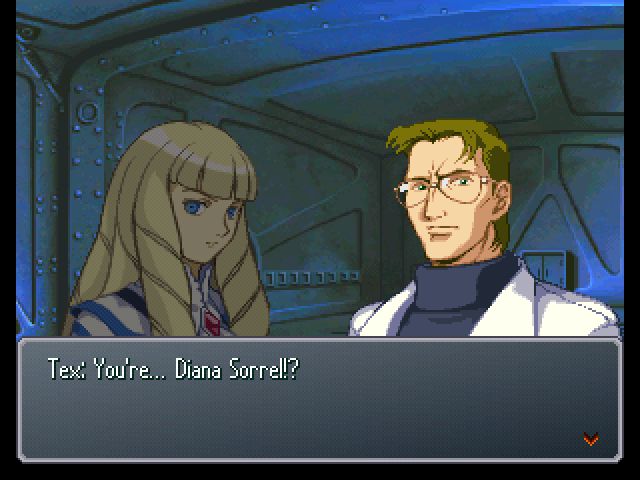 The rest of this part plays out the same as the Turn-A one, with Tex showing up and seeing Diana Kihel. This part plays out the same as well, only it's Usso and Marbet instead of Akira and Mari. 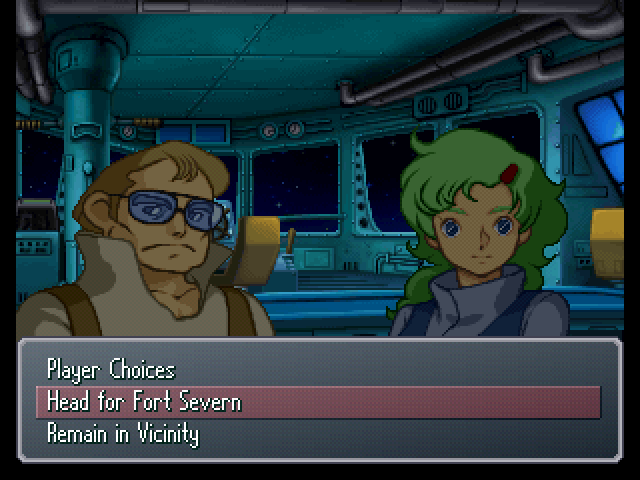 Just think, after I finish both the Turn A and Gundam X routes, I will be close to being half-way done!